EMG and EOG artifacts – friend, foe or both? Our earlier blog briefly introduced the topic of EEG artifacts. Basically, artifacts are noise sources that have overlaid onto the EEG and corrupted the purity of the brainwave signal when they are present. This is where noise filtering electronics, special materials and industrial design techniques are necessary to reduce noise influences. Two artifact types deserve some special attention here. The first is known as an EMG (electromyogram) artifact. The second is called an EOG (electrooculogram) artifact. In a nutshell, EMG is essentially electrical “noise” generated by facial muscle activity near the electrode. EOG is electrical noise generated by eye movement. Some might consider EMG and EOG the evil cousins of EEG. They are always hanging around, looking for trouble, and interfering with what the EEG is trying to do, which is to capture a clean brainwave signal. EMG and EOG are read by the same electrode that captures EEG, and the waves essentially collide with one another, creating a real mess. EMG and EOG are not always present, but when they are, the EEG gets corrupted. So, what could possibly be good about EMG and EOG? When we blink, wink, look left, right, up or down, we produce EOG. When we tighten our forehead or jaw, we create EMG. If an electrode is placed close enough to these noise sources, they can be captured. These signals are much stronger than EEG (10-200 times as large) and are not difficult to identify. We’ve already discussed EEG algorithms, but what if we developed a way to identify, capture and quantify EMG and EOG events? We might call these EMG and EOG algorithms. Would they serve any purposes? Take this young lady in the photo. What if you could not only capture her winking, but also the strength of her wink? First, yes, it would be useful to know when EMG / EOG events are present as an indicator that the raw EEG wave is being corrupted by the artifact (such as during her wink). Someone analyzing the EEG could simply ignore the EEG during those moments as invalid. From a different perspective, these artifacts can also tell us what the person using the EEG hardware might be doing facially. It’s sort of a 2-for-1 deal. Whereas the original purpose of using the EEG equipment is to capture a person’s brainwave activity, there is this secondary facial information that we could potentially be using for other purposes, even if it has had detrimental effects on the brainwave data itself. The artifact information can be important and useful, especially as a control signal that we will discuss in later blogs. For now, let’s just consider EMG and EOG artifacts as both foe AND friend. We’d much rather not have them around, but since we do, we might as well take advantage of what they can tell us. 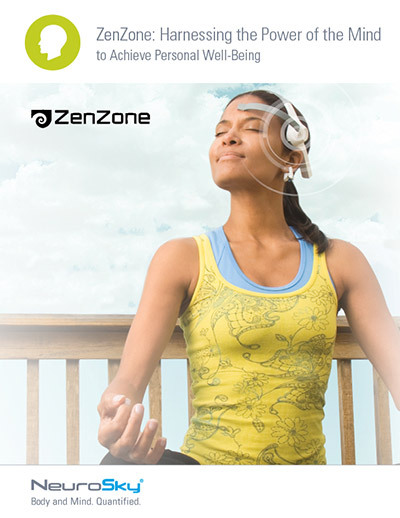 Download the Success Story to learn how ZenZone partnered with NeuroSky to enable improved brain fitness and sustained behavioral changes through EEG biosensor technology.